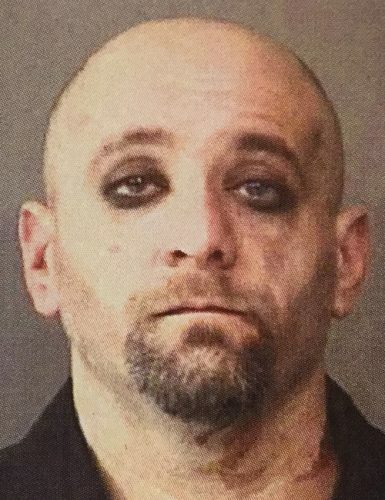 MILFORD — Terry Howard, 42, CR 1000N, Milford, was arrested this morning around 9:11 after a pursuit involving Kosciusko County Sheriff’s Office, Indiana State Police, Milford Police and Indiana Conservation Officers. It is expected Howard will be charged with fleeing law enforcement and violation of a protective order. Howard was arrested at CR 1050N and Orn Road, east of Milford when his vehicle, a Dodge pick up truck, became stuck in a field, after he failed to negotiate a turn. Events began at 8:21 a.m. when police were notified that Howard was violating a protective order at a residence on CR 1000N. According to information at the scene Howard was on foot around the residence and allegedly entered the residence before taking off. Police began a search of the area with a trooper with the Indiana State Police locating the vehicle and driver in the area of CR 900N and Old SR 15 and a traffic stop was initiated. However, Howard took off, going through a field between Old SR 15 and SR 15 on CR 900N, then heading northbound on SR 15 toward Milford. Police pursued Howard onto CR 1000N with stop sticks being deployed at CR 1150N and Orn Road. Howard’s truck hit the stop sticks blowing out the two front tires, however, he continued southbound on Orn Road, going into a field at CR 1050N. Officers were also searching the area of Mock Road and the area of Syracuse and Shaffer streets in Milford following reports that a truck matching that description was seen. Howard was arrested without incident. Howard was arrested on Nov. 3 on a charge of domestic battery and held on $1,000 cash bond at that time. A Dodge pick up truck, driven by Terry Howard, 42, Milford, is shown stuck in a field at CR 1050N and Orn Road, Milford, following a pursuit by police. One of the front tires on the truck shows evidence of being blown by stop sticks deployed by police.